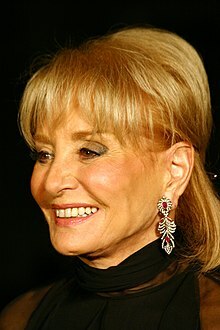 Barbara Walters (born September 25, 1929) is an American media personality known for her many years as the first woman network news anchor, on ABC News starting in 1976. Now here I was, half Jane Wyman, half Shirley Temple, and people began to stop me in the street and say, 'Don't worry, Barbara, it's all right, you won't lose your job.' It was really very touching. A great many people think that polysyllables are a sign of intelligence and refinement so they think they will impress others with their command of obscure words. We thought that he was going to be -- I shouldn't say this at Christmastime -- but the next messiah. Interview with Piers Morgan, 12-17-2013. A man cannot be comfortable [or cannot be made comfortable] without his own approval.